Is drawing an essential part of the human spirit? I think Werner Herzog’s 2010 documentary film, Cave of Forgotten Dreams, answers the question by illuminating the spirit of an ancient drawing hand that may dwell in each of us. Although the emphasis of the film concerns paleontological aspects of cave rock art, I’d like to offer an opinion from the perspective of an avid sketcher. 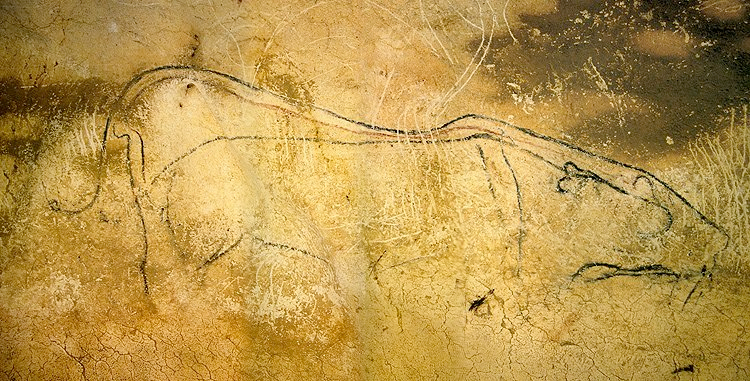 Following our guide deep into the mysterious Chauvet Cave in France, we become entranced by the emotional power expressed in lines and shapes created more than 30,000 years ago—to date, the earliest known invention of figuration of animals. * As we slowly pass each stone age picture in the dark caverns, a curious, primal urge to draw rekindles in the imagination, perhaps a sensation not felt since drawing pictures of animals in our childhood. We sense that all the drawing lessons we’ll ever need to know are preserved on these prehistoric walls. The astonishing depictions by these Paleolithic artists clearly demonstrate their knowledge of realistic proportions and movement of animals. Facial expressions of snarling cats and bears are convincingly rendered in exquisite line work. Action, such as a horse whinnying or rhinos fighting is shown by amazingly accurate leg, head, and body positioning. Of particular interest to me is a large rendering found in what has been named the Chamber of Lions. It shows a female lion alongside the flanks of a larger male. (The image may confirm speculation by scientists that prehistoric male lions did not have manes.) Her slender body overlaps the male’s, cleverly depicting the illusion of depth on the 2D wall surface. The technique of drawing realistic contour lines for the curves of the backbones, leg muscles, and affectionate nuzzling by the female demonstrates the artist’s power of drawing from observation and memory. Complex details are simplified with carefully drawn contour lines without losing the intent of realism. Incidentally, claw scratches made by ancient cave bears, who may have inhabited the caves, add a ghostly illusion of grass and trees—a sort of cosmic artistic collaboration between species. Perhaps our ancient ancestors found it easier to capture the life of a lion with contour lines than with a spear. Herzog’s film sets out to unravel the narrative laid out on the cave’s walls, crossing back and forth between the dreams and reality of prey-vs-predator life 300 centuries past. Long before written language existed, these Paleolithic humans must have been overwhelmed often by the perilous adventure waiting outside the front door of the cave—a chilly, lush, glacial landscape teeming with woolly rhinos, giant bears, and hungry lions. And yet, we see in these earliest known masterworks from nature, delicate line work displaying deep human sensitivity for drawing from observation and imagination. We see it because we, too, need to communicate through drawing. When it comes to the pure essence of drawing, the kind of drawing you experienced while sketching animals as a kid, these prehistoric drawings by unknown artists are the real deal. 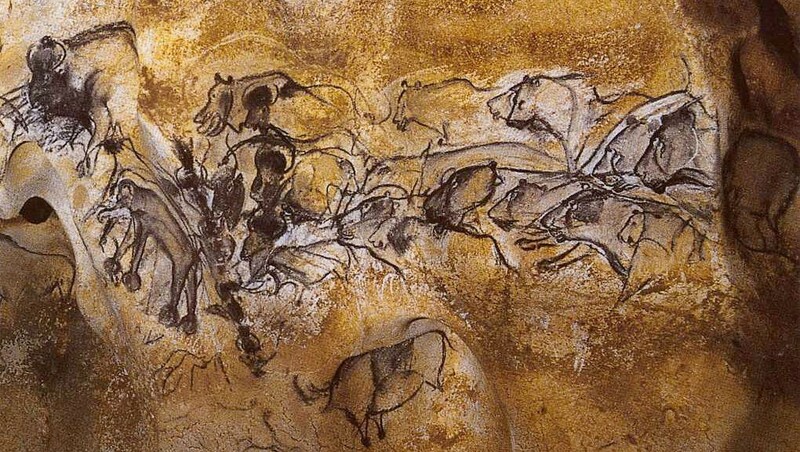 From a contemporary western point of view, it’s tempting to compare the lyrical traces of Picasso and Leonardo da Vinci, or even street graffiti art, with the pictures in Chauvet Cave. But all of our sensibilities about art quickly fall away once we invest time studying these ancient cave animal renderings. We begin to hear a spiritual call of the wild that has nothing to do with art galleries and museums, or whether we’re making good drawings or bad drawings. Each of us has our own cave of forgotten dreams where the essence of drawing remains sacred and precious. And we know it just as sure as the Chauvet Cave sketchers knew it. *Since writing this post, art found on the walls of a cave in Indonesia may be older than the Chauvet masterpieces (article).